Today I went to Dollar General to try out using coupons. They didn’t start taking coupons until the end of the month in August. I didn’t have many coupons on this trip. No one in my household has dentures……yet, anyhow! 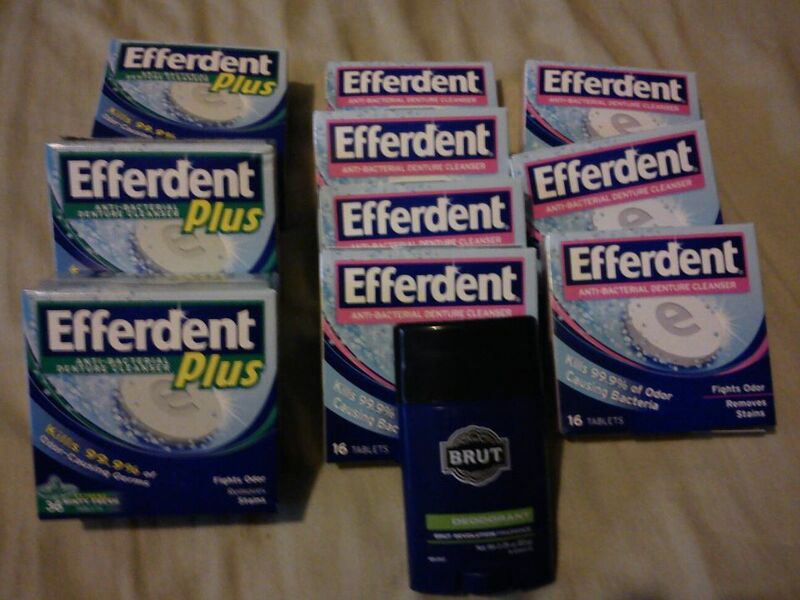 So what are we going to do with 200 tabs of Efferdent? Clean the toilet bowl – drop in a tab, close the lid (if you have pets or children), let it sit and disolve, swirl brush around, flush….a clean toilet! Now….if you forget to swirl the brush around and just skip to flushing, you will see where the Efferdent worked and where it didn’t reach. I made this mistake the first time. So our cleaning took 2 tabs! Use to unclog a drain. Drop a few tabs in the drain, follow with a cup of white vinegar. After around 10-15 minutes pour hot water down the drain. Use to clean coffee stains from your favorite mug, or even help removed dried up food on your dishes. What are your favorite uses of Efferdent?